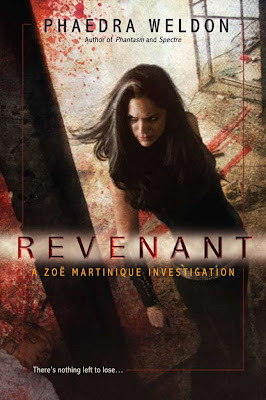 Phaedra Weldon posted the cover to Revenant, the fourth book in her Zoe Martinique urban fantasy series following Wraith, Spectre, and Phantasm. I just love all of the covers to the series and this one is particularly atmospheric. Coming June 1, 2010. Thanks to Dark Faerie Tales for the heads up. I like this cover! It automatically makes me curious about the book. Fourth already Mardel. I remember what a thrill it was to read the first. Fascinating that Weldon has made Zoe mute. What a writing challenge. Ladytink there's lots to recommend about the series. Solid characters, fresh supernatural take, lots of action. Humour too.